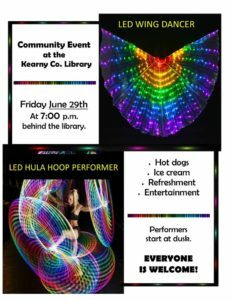 COMMUNITY EVENT at the Kearny County Library. June 29th at 7:00 p.m. behind the library!!!! Everyone is WELCOME! Please join us on Friday, we will be showing a great movie at 5:30pm. Plan on joining us for a great family movie, popcorn and a drink. Join us for summer reading , we start on June 4th. 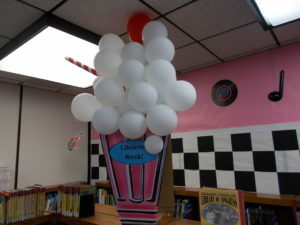 Fun, music, crafts, movies, prizes and awesome decorations. Thank you Cesilia for your wonderful talent on the decorations!